features Liquid Thermoplastic in addition to Handicap Blue and FIrelane Red. Our Federal Spec TTP-1952b is also available. 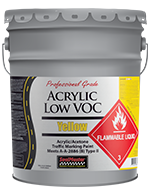 High performance 100% acrylic emulsion paint designed for bright, durable traffic markings on asphalt or concrete roadways and parking lots. Available in white or yellow. Designed for ADA compliance. 100% acrylic emulsion paint. Formulated for lasting durability. Designed for marking firelane areas on parking lots. 100% acrylic emulsion paint. Bright, vibrant color. 100% acrylic premium grade traffic paint. Meets federal specifications. Provides bright, durable traffic markings. Available in white and yellow. 100% acrylic high solids formula. Fast-drying formula meets TTP-1952E Type I color specifications. Available in white, yellow, and handicap blue. High solids 100% acrylic traffic paint. Dries in less than 5 minutes. Available in white and yellow. Meets TTP-1952D and TTP-1952E. Game Time Field Marking Paint is a fast-drying latex paint designed for marking playing lines on natural grass athletic fields.